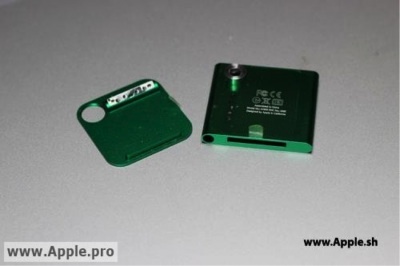 Last April, Taiwanese site Apple.pro posted a photo of what appeared to be an iPod nano with a hole in the rear casing that was said to be for a camera. A second photo showing the casing from the other side surfaced a month later, appearing to show a clipless design for the device and claiming that it would carry a 1.3-megapixel camera. Apple ultimately made no changes to the design of the iPod nano in September of last year, instead opting to update the software and lower pricing on the 8 GB and 16 GB models. But the idea of a camera-equipped iPod nano was revived in November with the publication of a May 2010 patent application on speaker design that appeared to show a hole in the iPod nano's clip in the same location as the rumored camera hole seen in the leaked photos. 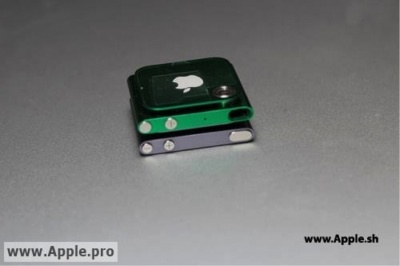 Apple.pro now reports [Google translation] that a series of new photos have surfaced showing this camera-enabled iPod nano casing in even more detail. The new photos clearly show the device retaining its clip-on design with a metal housing for a camera assembly protruding from the back of the main case and sitting flush with a hole in the device's clip. 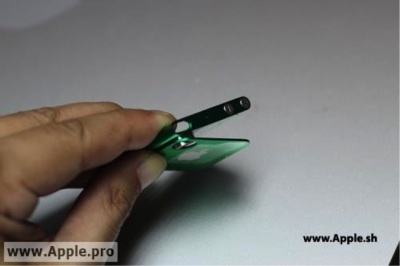 The design would allow Apple to squeeze a camera into the current diminutive form factor of the iPod nano by moving much of the lens and sensor hardware outside of the main casing but still within the overall device envelope by utilizing a small portion of the gap between the device and the clip. 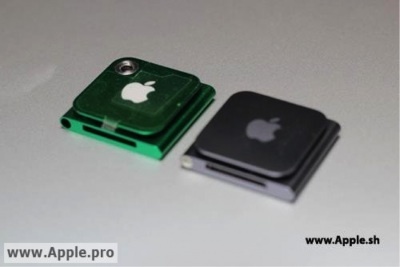 Given that this design for a camera-equipped iPod nano has been floating around for some time and did not make an appearance during last October's update, it is unclear whether the design is still in the works for Apple or if it has been scrapped for some reason. The company had previously introduced a low-resolution video-only camera on the previous iPod nano form factor, but removed the feature when it redesigned the device with a smaller, iPod shuffle-like form factor in 2010. An Apple patent application filed in late 2009 also suggests that Apple has an interest in equipping the current iPod nano design with a camera, offering it as one example of an environmental sensor that could be used to allow the device to display screen savers and other content that relate to the device's environment such as the current weather or other factors. Finally, I can take .5 megapixel pictures while I'm jogging or on the treadmill! I hate that stupid little nano. I'd rather the iPod Nano have a front facing camera. True. The best Nano by far. A back camera on that thing seems totally useless. If they added a front camera that would be different. Imagine an official watch case for it allowing you to FaceTime with your watch! Futuristic! A camera on a nano is just pointless. I have a 5th gen which is the one before before they changed to this design that had a camera (the 5th gen was the best imo, and still is), but I have never once used the camera. I just don't see any use for it really. I always liked the size of the 3rd gen Nano. The colour options were horrible and it gained the nickname "fat nano" but it's stumpy height always made it seem small in comparison to gen 1, 2, 4 ,5.